Alaska Air Group is adding a solid mix of regional, transcontinental and international routes in 2015, which is one driver in its projected 10% capacity growth. Other elements of its ASM expansion include frequency additions in core markets and aircraft upgauge. The company is adding eight new flights from its largest hub and headquarters in Seattle and five from its base in Los Angeles, with varying degrees of competition. Overall Alaska continues to add routes where it can leverage points of strength to broaden its network utility. Alaska continues to battle unit revenue pressure, a trend sweeping much of the US domestic market place. But it is still delivering top line profits, recording margin expansion and expanding shareholder returns in 2015. Alaska projects 10% capacity growth year-on-year in 2015 – 3.4ppt from new markets (some annualised from the year prior), 3.6ppt of increases in core markets and 3ppt from aircraft upgauge. The airline has been taking delivery of higher density Boeing 737-900ERs, and has also added six seats to its Boeing 737-800s and nine to its 737-900s. Orders include those placed directly by the operator and by lessors assigned to the operator, from 10-Jul-2015 onwards. Among Alaska’s new routes in 2015 are eight form its largest hub in Seattle – Helena, Washington Dulles, Oklahoma City, New York JFK, Milwaukee, Oklahoma City, Nashville, Raleigh-Durham and Charleston, SC. Alaska will be the only operator on flights to Helena, Raleigh-Durham, Nashville and Charleston. The airline is competing with United on its new service from Seattle to Washington Dulles. 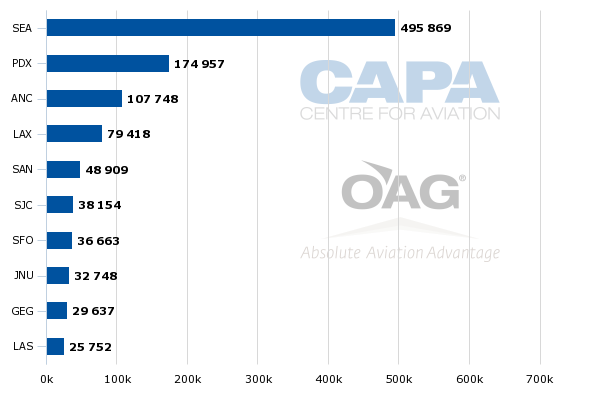 Data from CAPA and OAG for the week of 7-Jul-2015 show that Combined the two airlines offer roughly 2,758 one-way seats on the pairing with United holding a 76% share and Alaska representing a 23% share. Alaska is competing with Southwest on new routes from Seattle to Milwaukee, representing a 19% share of the approximately 2,758 one-way seats on offer. Southwest holds an 81% share. Alaska’s new route from Seattle to JFK begins in Sep-2015, and its competitors include Delta, American and JetBlue. For the week of 28-Sep-2015 to 4-Oct-2015 one-way seats on the route are projected at roughly 8,985. Delta will hold 53% share, JetBlue will represent 22% of the seats, Alaska will hold a 13% share and American will have a 12% share. With Alaska’s point of strength in Seattle, it should spool up the new routes in a reasonable period of time. It is not injecting a huge amount of capacity into markets where it has direct competitors, and should drive some lower pricing points during its initial spool up. Obviously the market to JFK is highly competitive, but Alaska’s large frequent flyer base in Seattle should allow for some traction on the new transcon flights. Alaska’s new routes from Los Angeles include Liberia and San Jose, Costa Rica, Monterey, Baltimore/Washington and seasonal service to Gunnison/Crested Butte, Colorado. Alaska will compete with Delta on the new service to Costa Rica. 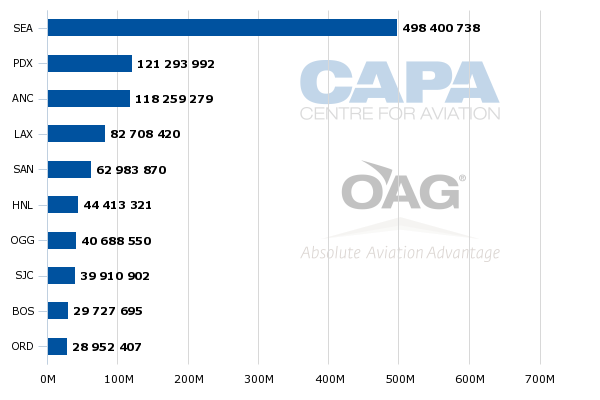 For the week of 2-Nov-2015 to 8-Nov-2015 data from CAPA and OAG show that the airlines will offer roughly 1,009 one-way weekly seats, with Alaska representing a 52% share and Delta holding a 48% share. During that same time, the airlines are operating approximately 1,812 weekly one-way seats from Los Angeles to San Jose, with Delta holding a 73% and Alaska with a 23% share. As previously reported by CAPA, there is likely enough demand for two airlines to serve those routes given the growing number of travellers between the US and Costa Rica. Alaska becomes the fourth airline between Los Angeles and BWI when its new flights begin in Sep-2015. 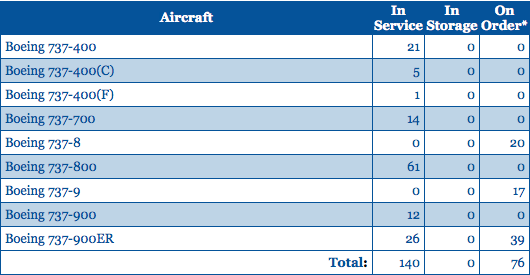 Projections for the week of of 28-Sep-2015 to 4-Oct-2015 show that Alaska, Spirit, United and Southwest will offer roughly 5,442 one-way seats on the route. Southwest will hold a 38% share, United will represent a 22% share, Alaska’s share will be 21% and Spirit will hold an 18% share. It is an interesting mix of a ULCC, a hybrid-like airline, and two major airlines. As ULCCs Spirit and Frontier continue to grow, more routes with airlines operating under differing business models will continue will appear in the US market place. Alaska will compete with American and United on new flights from Los Angeles to Monterey. The new flights join Alaska’s existing service from San Diego to Monterrey. Rounding out Alaska’s new markets are flights from Portland to Austin, from Boise to Reno and between Eugene and San Jose. It appears that Southwest has served Portland-Austin seasonally, but schedules do not show that it will be operating on the route when Alaska launches service. Alaska is uncontested on the new Boise-Reno and Eugene-San Jose pairings. Alaska is adding a solid mix of markets where in some cases it is busting monopolies, and in others is uncontested. And in the case of Seattle-JFK and Los Angeles-Baltimore, entering highly contested markets. With the new Costa Rica flights it is expanding its international offering beyond transborder service that includes Puerto Vallarta, Mexico City Juarez, Mazatlan, Manzanillo, Los Cabos, Vancouver, Victoria, Loreto, Kelowna, Ixtapa and Calgary. Hawaiian and other airlines have been adding capacity between the US West Coast and the islands, and Alaska has warned that total seats from the West Coast into Hawaii would rise 12% in 22015. Alaska Air estimates that roughly 17% of its capacity will be deployed onto its Hawaiian routes in 2015, and has stated the added capacity during 2Q2015 will likely pressure its unit revenues for the quarter. Capacity growth continues between the West Coast and Hawaii late in 4Q2015 when Virgin America introduces new service from San Francisco to Honolulu and Maui. Alaska operates flights from nearby Oakland to Honolulu and Maui alongside Hawaiian, which also operates flights from San Francisco to Honolulu, competing with Delta and United. Hawaiian and United also operate service from San Francisco to Maui. Similar to many US airlines, Alaska has been battling weakness in passenger unit revenues, which for Alaska is driven in part by the capacity additions that it and rival Delta have made in Seattle. Its passenger unit revenues fell by 6.4% year-on-year in both Apr-2015 and May-2015, which points to a decline in 2Q2015. The decline in unit revenues should slow as the US summer high travel season begins, but it is not clear when Alaska’s unit revenue performance will fall in line with industry averages. Alaska’s 1Q2015.4% unit revenue decline was the largest among American, Delta, United, JetBlue, Hawaiian and Southwest. Alaska’s unit revenue performance has underperformed the industry at large for about a year and a half. But during that time its margins have continue to grow and its profitability has remained intact. It plans to return USD550 million to shareholders in 2015 through dividends and share repurchases, up from USD415 million in 2014. Obviously the lacklustre unit revenue performance is not viable for the long term or in the event that fuel costs undergo a rapid increase. But for now Alaska remains on solid footing, growing its network from points of strength and injecting some fresh competition into markets while it continues to build out is network – a solid strategy for an airline that still only represents 4.6% of US domestic ASMs.